Sunlit Pages: Reading With the Seasons: Fall, October, Halloween, etc. Reading With the Seasons: Fall, October, Halloween, etc. "When the furnace groaned for the first time in months, the smell of a new season filled my house. I knew it was just dust, but the smell somehow always signified the official end of summer . . . "
That's taken from Dancing on Broken Glass, and that moment happened for me just two days ago when I woke up and the house felt absolutely frigid (it wasn't, unless 68 degrees is frigid, but I could definitely sense that it wasn't summer outside anymore). We caved and turned on the furnace, and I happily sat in front of the heater vent for the next ten minutes (one of my favorite wintertime activities). Last night, after a chilly T-ball game, Mike started a fire in the fireplace (it was our first time using it since we moved in last March). Call me weird, but I decided I'm definitely partial to furnace dust than wood smoke. With the cooler weather, my reading has taken a turn in a similar direction. 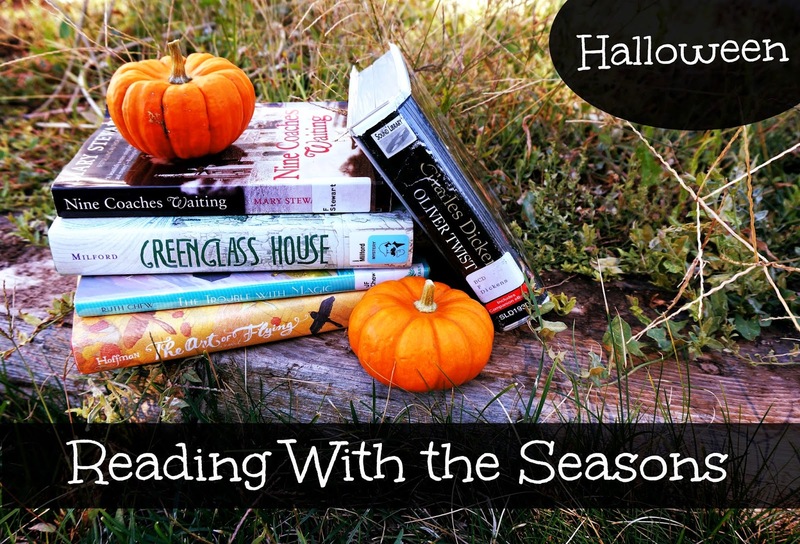 I haven't done a Reading With the Seasons post since the Thanksgiving edition last November, but as I looked through my reading pile, I realized that almost all of the books were spooky, mysterious, or suspenseful--all things I look for in a good October read. The Art of Flying by Judy Hoffman; I reviewed this one on Wednesday, and, like I mentioned then, this is the perfect book to read in October (especially for the 12 and younger crowd). Oliver Twist by Charles Dickens; am I the only one who thinks that, in general, a Dickens novel just lends itself really well to fall reading? I'm halfway through this classic (I hadn't read it before) and am absolutely loving it. Nine Coaches Waiting by Mary Stewart; I'm just a few pages into this one, but I can already tell that it's just the kind of book I love to read during this time of year: the characters are cloaked in mystery, it's set in the elegant (but foreboding) Chateau Valmy, and danger is lurking around every corner. Greenglass House by Kate Milford; this brand-new middle-grade novel has been getting tons of attention on lots of Newbery 2015 lists. I haven't started it yet, but it looks like it's actually set in winter, so maybe October isn't the perfect month to read it in. Then again, here in Utah we often get our first snow of the season in October (don't say it!!! ), and it's a mystery, so it might still fit the bill. The Trouble With Magic by Ruth Chew; I'm excited to read this book to my boys. Ruth Chew wrote dozens of fantasies for children, many of which sound much more Halloweenish than this one (like No Such Thing as a Witch or What the Witch Left), but this is the one we have. The Night Gardener by Jonathan Auxier; it's a Victorian ghost story--what more do you want? The Graveyard Book by Neil Gaiman; I'm kind of terrified to try Neil Gaiman, but I think if I'm ever going to do it, October's the month for it. A Tale Dark and Grimm by Adam Gidwitz; one of my friends really liked all the books in this series; it sounds a little gruesome, but I guess that's to be expected with something based on Grimm's fairy tales. The Bone Shaker by Kate Milford; I know next to nothing about this book except that it sounds a bit creepy. Doll Bones by Holly Black; even though this is middle-grade, it might be a little dark for my tastes. Has anyone read it? And now all I want to do is grab one of these books and curl up in front of the fire heater vent. Which books are you planning to read this month? Any recommendations for something that seems especially appropriate for Halloween? P.S. For more Halloween suggestions, see the 2013 list and the 2012 list. Don’t forget to read The Wolves of Willoughby Chase . Now it’s kind of hard for me to remember it but I know the kids and I just loved it when we read it aloud. Maybe it’s time to read it again. I think we liked the first one the best. Your October reads sound amazing! Loooove the font on Greenglass House. I guess I like books that are a little on the dark side because I LOVE a good autumn read:) Thanks for all of the great ideas. The beginning of The Graveyard Book is the hardest so if you can get past that you should be fine. I've been planning to read Doll Bones for a while. When I get to it we'll have to chat. Thanks for joining the link up, I can't wait to add some of these to my to-read list! I'm reading one of Ruth Chew's books to my kiddos, and they are loving it! I can't wait to see your reviews for the others! Oh, another vote for The Wolves of Willoughby Chase! i LOVE The Graveyard Book. My favorite October book is "Something Wicked this Way Comes" by Ray Bradbury. Delightfully and beautifully Autumn. I haven't read Something Wicked but can see how it would be perfect for this time of year!